O2 customers reported that the firm's activation system crashed this morning as they raced to get their new 3G iPhones, but the telco insists everything is going swimmingly. One reader in West London told El Reg that the manager of his local O2 shop said the computer system for activating iPhones “has crashed, and it’s the same phone across the country. Nobody has left with an iPhone yet and the store has been open for half an hour! Forumistas on hotukdeals reported similar problems in the Midlands and across the country. Another customer expressed fury that customers sat twiddling their fingers were told they could not come back and pick up their phones later as, "it's first come, first served." Apparently the store manager quickly reconsidered when confronted by a shop-full of furious O2 subscribers. Some stores let customers fill in the paperwork, and take their unactivated phones. It appears the problem kicked in when store staff started trying to run credit checks through the stores systems. However, customers who were upgrading were also caught in the net. ”How could they not see this coming?” our West London reader asked. How indeed, given that earlier this week, the firm texted customers to alert them to the launch and asking them to pre-order via its website – only for the website to crash. Except, according to O2 there is no problem. No problem at all, according to a spokeswoman we tracked down, who just happened to be in the mobefirm’s Oxford Street store. The activation system was up, and had never been down and average transactaction times were taking 20 minutes, which was perfectly normal, the spokesperson said. O2 has been back in touch, to say "The latest is that our systems are up and running but have been working slower than normal today. Transaction time is 20 minutes, which is business as usual. 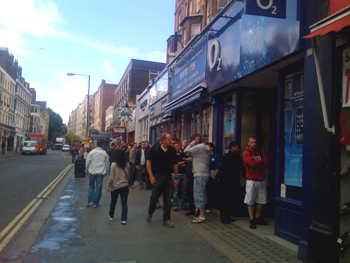 Everyone who queued this morning at the Oxford Street store has walked away with an iPhone 3G." Readers have been in touch within the last hour to say they were still waiting to be processed, and that many early morning customers had left the O2 stores, either in disgust, or because they had to go to work. Is this the queue for the credit crunch?